The Concordant Version presents God’s Word in a most useful form. It is a literal translation, seeking to carry over the Original text through a consistent “concordant” English vocabulary. The Concordant Version presents God's Word in a most useful form. It is a literal translation, seeking to carry over the Original text through a consistent "concordant" English vocabulary. The type is large and readable, with boldface representing the actual English translation of the original Greek and lightface showing English words added for idiomatic clarity or to reflect grammatical significance. Each page has wide margins. An abbreviation key is provided, and there is a comprehensive Explanatory Introduction as well as six pages of Instructions for Use. 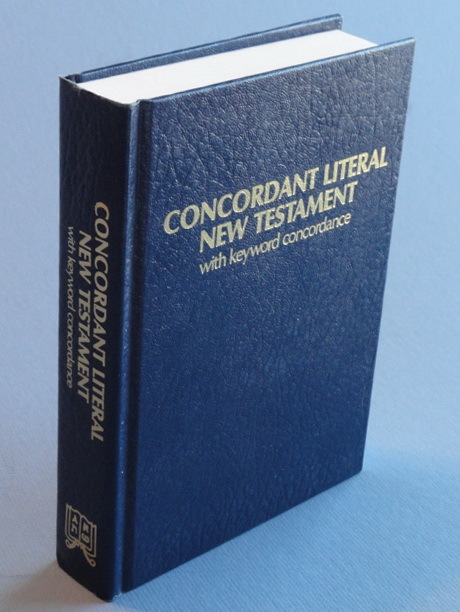 The simulated leather (Hardbound) Version is bound together with the KEYWORD CONCORDANCE, in which the English words used in the text are arranged alphabetically. It is at the same time a Greek concordance, because the entries, though listed in English form (according to the primary English Keywords), represent the original Greek words. In addition, the respective word in the Greek original is always added (in Roman characters) beside the English standard. At the end of each entry is given a list of all the words used in the Authorized (King James) Version for that Greek term. In addition, these AV terms appear in regular alphabetical order in this Concordance, together with a reference to the Concordant Keyword. Please note: the paperback version does NOT come with the Keyword Concordance.